Apartment life does not preclude gardening. 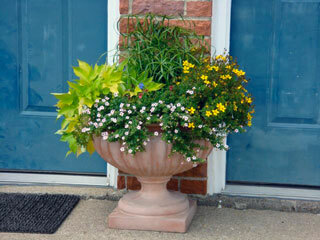 Many plants thrive in a small garden plot or container. Flowers, herbs and many vegetables will thrive in container gardens to beautify your outdoor living space or feed your family. Containers are a great way to garden if you want to be able to move your plants, plan to bring them in during the winter or need to keep them away from critters. Ohio State University has recommendations for growing cucumbers, peppers, squash and tomatoes in container gardens. It's easier than you'd imagine! It's more work getting started that a traditional, "in the dirt" garden but the results are still pleasing. Herbs are most often used for seasoning in cooking. Fresh herbs are much more flavorful than the dried herbs you can buy at the grocery and once you start cooking with fresh herbs, you'll be hooked forever. Not only does it save a lot of money to grow your own, the difference in flavor is astounding. Herbs that are easy to grow from seed include sweet basil (deer resistant), chives (hardy perennial, deer resistant), sweet marjoram (annual), mint (hardy perennial), sage (hardy perennial), summer savory (annual), sesame, and thyme (hardy perennial). tutorial on growing basil that shows how very easy it is to have fresh basil (deer resistant) in your garden. There are over 40 varieties of basil. It comes in several colors and many interesting fragrances like lemon, anise and cinnamon. It's said to have some healing properties as well. Cooking with basil offers many options and it is easily grown inside or frozen for later use. Vegetables: Tomatoes, Beans, Peas, Peppers, Tomato Gardening Tips. Peppers are difficult to start from seed so novices are advised to begin with nursery plants. You can often find starts at your local grocery or hardware store at the right time for planing in Ohio. All varieties of peppers require full sun. They like hot weather and moist but not wet soil. Growing peppers isn't too difficult and the with the results you can enhance salads or make your own hot salsa. Just be careful you don't plant sweet peppers too close to hot peppers. Visit the University of Minnesota site for a list of plants that discourage deer and rabbits(often eats the same plants as deer). Also see Deer Proof Garden for a more options. Possibly the easiest control for deer is the use of Milorganite, which is a fertilizer. With one product you can fertilize your garden and repel deer.